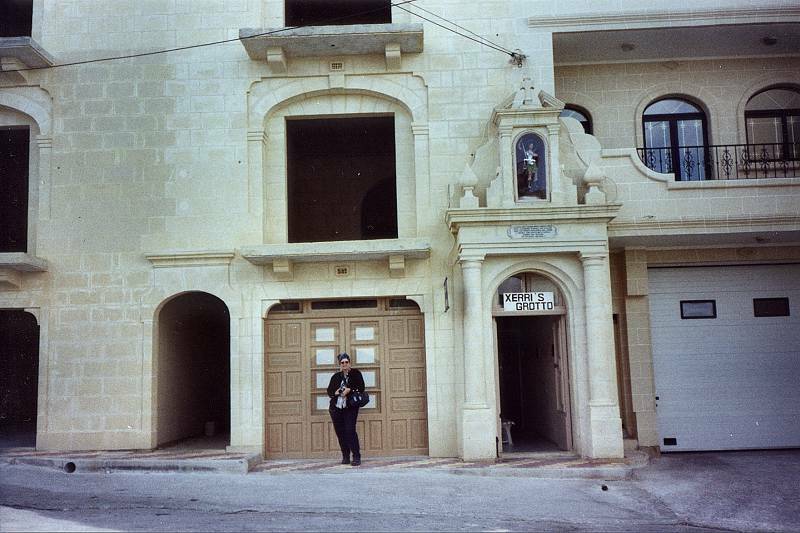 Image: Gozo Xerri's Grotto, Anne Oldham. © Tony Oldham, 21-FEB-2002, with kind permission. Open: All year Mon-Sat 9-18. Bibliography: Trevor S. Shaw (1951): The Caves of Gozo, BSA Cave Science, (16) pp. 339-347. Address: Xerri's Grotto, Triq L-Għar ta'Xerri (Xerri's Grotto Street), Xaghra, Gozo, Tel: +356-560572. 1924 discovered by the guide's grandfather whilst he was digging a well. A small cave with nice speleothems located below a residential building. This is located 100 m from Ta Ninu Cave, and is larger and more varied than Ninu's Cave. It is well sign posted and is best reached by taking the road on the western side of the main square, and turning right at the T junction, and after 120 m turning left down Triq L-Għar ta'Xerri. The cave was discovered in 1924 by the guide's grandfather whilst he was digging a well. As soon as he broke into the cave he abandoned the well and began to excavate what is now the show cave. The entrance is gained via a 10 m spiral staircase which is the dimension of the original well, thus this cave is not suitable for anybody suffering from vertigo, unsteady on their feet, or just fat! Behind the staircase is a passage 7 m long. In front of the steps the passage widens to about 3m. This is a circular tour about 30 m long. The whole passage has been dug out to about 2 m high leading past some very pretty formations in passages that are only 25 cm to one metre high. About half way round it is possible to see the replacement well which was formerly used as drinking water and is now used for irrigating the garden. There are also some interesting formations which have developed as the result of calcification of tree roots. 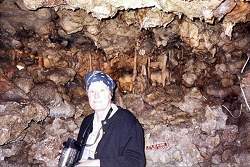 Part of the excavations were carried out during the second world war when the family used the cave as a shelter. The roof of the cave is flat, but contains a series of shallow parallel channels, which do not appear to have been formed by water, and it is presumed that these indicate the direction of the joints along which the cave was originally formed. The guide will point out speleothems resembling a tortoise, a vulture, a giraffe and a pair of elephant's ears. He speaks good English and is a source of family anecdotes relating to the cave.